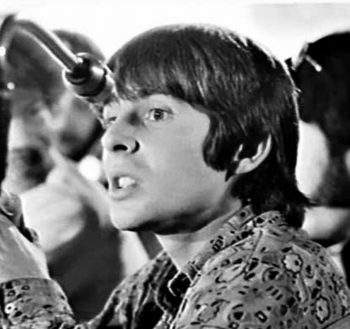 After The Monkees frontman, Davy Jones, died of a heart attack at age 66 on February 29, 2012, his family took the very unusual step of having Davy Jones Will and related probate court documents sealed — perhaps to shield family disharmony from public view. Davy’s family, led by his oldest daughter, Talia Jones — who has been named as the personal representative to administer the Davy Jones Estate — asked the Judge to seal the file. The request, according to this gossip website that obtained a copy of it, argued that the court should deny public access to his “planning documents and financial affairs as public opinion could have a material effect on his copyrights, royalties and ongoing goodwill.” The request was granted, without opposition. So what is so unusual about Davy Jones’ will and financial status that could negatively impact his estate’s royalties and goodwill? Good question. Perhaps it has sometime to do with his widow. Jessica Pacheco-Jones is the 33-year old widow of Davy. Yes, this Telemundo TV host and former Flamenco dancer is half his age. If you’re keeping track, that means she’s younger than two of his four daughters (whose ages range from 23 to 43). Jessica was not named in the will, which was dated March 30, 2004 and predated their marriage by more than five years. When Davy and Jessica wed in August, 2009, it was reported that his four daughters stayed away from the wedding, not being fans of Jessica. Whether that is true or not, Davy did admit to some friction with his daughters caused by Jessica’s age. That being the case, it is very odd that Davy did not update his will to address what he wanted to leave Jessica. The couple was married for two-and-a-half years before his passing. So is Jessica left out of his estate completely? No. She recently filed a request with the probate court to be treated as a “pretermitted spouse.” This is a spouse who was married after the will was created and by Florida law is entitled to receive one-half of the estate. The only exceptions would be if a prenuptial agreement provided otherwise for her or if the will had a provision that the spouse would not be included. Because in this case the will was sealed, we don’t know what language it may have had about any new wives in the future. We also don’t know Davy’s financial condition. It’s entirely possible that the secrecy relates to money trouble instead of his wife’s relationship with his daughters. Davy reportedly owned a condo in Fort Lauderdale and a ranch in central Florida with 14 horses, plus he clearly received significant royalties from his days as a singer and songwriter with The Monkees. Add it all up and it leads to a lot of interesting questions, made more intriguing by the fact that the family is trying to keep the specifics of his estate quiet. Keeping estates private is a noble goal; in fact, that’s why we recommend that most people use living trusts. When used properly, they avoid probate court entirely and keep everything private. Davy Jones’ family certainly would have been better off had he worked with an experienced estate planning lawyer and created a trust. At the very least, Davy should have updated his will after he and Jessica wed. Whether he wanted her to receive more or less than his daughters, it should have been a choice he made. Now, the laws of Florida will decide how much everyone gets of his estate. And, if there are questions about the wording of his will or a prenuptial agreement related to Jessica, it could provoke a fight over what she may receive. Family fights between children from prior marriages and new spouses (especially when they are much younger) are common for families of famous and not-famous alike. In those situations, having the proper estate planning in place — and keeping it updated — is more important than ever. We’ll keep an eye on Davy Jones Estate — as much as will be publicly revealed at least — to see how all this monkey business plays out.